Rossi Rifleman • View topic - new distraction: rebarrel something to .357 SIG! new distraction: rebarrel something to .357 SIG! Well, there's no big post here - just got distracted reading various gun websites and searches. I've been so happy with my new/old .357 guns that my "stunning realization" of just how easily Glocks/M&P's/XD's/etc. in .40 S&W can be convertibles to .357 SIG got me hooked on this idea. Maybe get one of the decent police trade-in .40's at a good price, buy a barrel, see what happens. Even the once-fired .357 SIG brass is cheap, I think like 50 bucks a thousand or something. Like the fact that the magazines don't need to be special, just generic .40 mags. Re: new distraction: rebarrel something to .357 SIG! Should work. We have a H&K P2000SK in 357 Sig and I've given the thought about getting the 40 barrel and springs just to have a 40, but then I have very use or need for the 40 S&W. I do really like the 357 Sig. It's a snappy little beast and accurate beyond my eyes. I appreciate your input. The .357 SIG seems like a worthwhile round to mess around with - my idea is to get an ex-police turn-in .40 and do a barrel conversion. Depending on the price for the used 40 that's likely to be cheaper than the route we took. Disclosure: My real cause for this "new caliber distraction" came about due to my never-ending interest in the pairing of common-caliber handguns and carbines, believe it or not. Prepare yourself for a long "first cup of the day" ramble from Adam about guns!!! What drew me to RD's forum of course was my new (at the time) Rossi 92 in .357 flavor. I wanted to feel like I had a "go-to" forum of folks who I could depend on for help and ideas with my new gun. I'd been wanting a .357 carbine/revolver combo for years, and finally met my goal with the Rossi matched up with my new/old Ruger Security Six .357. This caliber combo isn't a new "fad" for me, I had gone through a period of interest in the .40 S&W and enjoyed a KelTec Sub2K .40 with a Glock 22 .40 for a good while. Fun to be able to share the same mags, all that stuff. But then, I experienced a real treat with several "antique" gun show finds in the mid-2000's, like old Stevens shotguns and my real joys, Remington 8/81's and 14's and 10's and 11's. So now, I am mostly in "retro" mode when I look over guns for sale and my thought process is more about finding something pre-Korean War era that's fun to work on. Well that is all well and good, but if you're a real "gun nut" like myself you eventually just can't help yourself, and in my case I have been shooting with my brother in law's guns including new M&P's and Glocks and such. Brought my thoughts back to another polymer handgun once more - so what does this have to do with a carbine combo? Nothing, except now my thirst for gun modification/fixing has turned to "convertible" autoloaders. .40's that can be simply converted to shoot .357 SIG, which I have really been hot to shoot for some time. In this case, I've got many options for having some flavor of .40 S&W/.357 SIG convertible and to make such a thing "my own" I figured I'd go the used police gun route. I like the new M&P's my BIL and nephew are shooting, they are fine guns. I know that the Glocks are fine too, from my fun with my own model 21 in .45 and model 22 in .40 in the past. I really like the geometry and design of the Springfield XD series. Used SIG 226/229 guns are nice. So there's plenty of ex-police guns I could pick from for this project, since .357 SIG barrels are being made for every one of these. Well, sorry to have taken the herd away from Rossi firearms yet again, Michael! From the choices listed I'd likely go with the Sig, wife has both the 238 and 938 and so far I've been impress, really superb machines. I've never been a fan of the Glock and the Springfield poly offerings always feel top heavy to me, but you have to consider that I cut my pistol teeth on Hi Powers, 1911s and single action wheel guns so the "tactical Tupperware" doesn't have the same appeal to me. Strangely enough I do like the H&K, I think it's the fit and balance. Just to come back to lever guns my current long range project is to get a Marlin 336 in 30/30 and have it re-bored and chambered for 38-55. Aside from the war horse collection I really like the cartridges from the transition period (BP to SP). On the 357 Sig I did anneal some 40 S&W cases to see if it was possible to make some cottage 357 Sig. Sort of worked but they come up too short. Since the case is supposed to head space on the case mouth like any self respecting auto cartridge I never bother to load them. I had a somewhat long reply typed up but the board logout monster ate it. Suffice it to say I've seen it done on Sigs, Glocks and XDs. I think Sig has even made factory conversion kits for it. 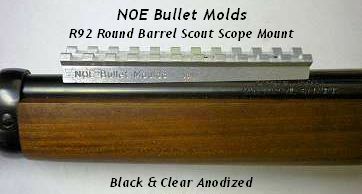 Lone Wolf has I think made conversion barrels for Glocks and other brands. Sometimes it is even possible to convert to 9mm although it may require a slide change regarding the extractor and the ejector may or may not function completely reliably. I haven't gone there. It does make some sense but would require me to add the .40 caliber ammo, components and reloading equipment. Likewise .357 Sig since I don't own that one either. I've still got some lingering reservations regarding .40. Although I think they've ironed out the unsupported chambers and the thin brass it initially started with I still see pregnant brass on the range and I see iron out kits from Lee and Redding as well as folks on the forums and YouTube willing to use them to return obviously overstressed brass to loadable dimensions. As for .357 Sig I think it's a nice round but I choose not to add another bottlenecked pistol round to my reloading at least at the moment. I already have 7.62x25. In practice I don't see myself swapping out parts on a regular basis. I think it has much more utility for those locations like Hawaii or European nations that limit the numbers of firearms one may own and you want to still have multiple calibers. I wonder if the new multiple caliber pistols being touted by Sig and others will actually get any use. I wonder how many of the Dan Wesson pistol packs ever had more than one or two of the barrel sets mounted for anything other than fit checking. I think convertible pistols are probably going to suffer the same fate in most cases. Actually I own a 9mm barrel for my CZ-52 but although I've tried it out a few times I typically leave the guns setup for their intended caliber and the 9mm barrel stays in the accessories bin. I thought the swelled case issue was a Glock issue over many calibers not a .40SW issue. There's an XD40c in my family that doesn't swell brass...the ejector dings it a little though. Any unsupported chamber with a hot enough load can bulge a case give the right circumstances. I've never had one but tend to not push the autos to extreme. I appreciate all your comments, guys. This is why I pose these sort of questions on this forum - even though I am derailing the discussion of Rossi firearms - it's because I know that there are guys and gals here with practical experiences with a deep variety of gun platforms. Be well, all. Enjoy your guns!